Meat scientist Dr Peter McGilchrist addresses the producer field day at Teys Jindalee feedlot near Temora this morning. Teys Australia has moved to establish its own Pasturefed Standard to underpin the company’s Grasslands branded beef program. The move means that beef producers from June will have two options in how they supply cattle for the Teys grassfed natural beef program – the existing industry-backed Pasturefed Cattle Assurance System (PCAS), or the company’s own new pasturefed standard, to be called Grasslands. Teys says the move is not an absolute withdrawal from the PCAS program, but simply provides an alternative, simpler, and cheaper pathway for eligible pasturefed cattle. Teys is releasing details about the program at a producer field day at its Jindalee feedlot in southern NSW today. The decision will inevitably mean fewer cattle passing through the PCAS program, launched by Cattle Council of Australia in April 2013 as a third-party, independently-audited farm assurance program built around grassfed standards. Teys Australia was the first beef supply chain manager to adopt PCAS four years ago, and has remained the dominant user since then. In launching its own Great Southern independently-verified grassfed natural program in October 2013, rival processor JBS Australia chose to develop its own pasturefed standard, rather than align with PCAS. Grasslands will be a single pasturefed standard right across the Teys processing business, combining both existing PCAS and ‘free-range’ programs from Biloela and Rockhampton in the north, to Naracoorte in South Australia. The company will continue to apply its no HGP, no antibiotics requirements to the new pasturefed model. The program will continue to be underpinned by Meat Standards Australia grading. PCAS program chairman, Marc Greening, who attended this morning’s Jindalee field day, said from a Cattle Council of Australia and PCAS perspective, it had always said that PCAS was there to set the industry standard, and set the tone for the industry to follow around grassfed claims. “PCAS is the highest standard available in the industry over label claims, but if other commercial companies want to go and do their own thing, they have our blessing,” he said. 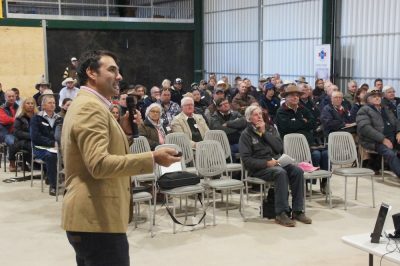 In explaining the reasons for establishing its own pasturefed standard, Teys Australia’s head of public affairs Tom Maguire said in order to fully meet the needs of its customers around the world, the company needed a broader livestock supply base, and determined that an alternative pathway to PCAS was the best way to achieve this. In essence, it appears Teys is banking on a substantially greater number of producers participating in the alternate pathway, as many of the ‘barriers to entry’ under the existing PCAS program are removed. “However we continue to recognise the PCAS model, and any producers who choose to continue to operate under PCAS will have automatic access to supply the Grasslands brand program,” Mr Maguire said. Mr Maguire said Australia’s natural grassfed beef had a tremendously exciting opportunity in the global beef market, and Teys wanted to develop a strong brand presence around that, with volume, while wanting to have greater equity in those brands. “Under the current model, Teys does not own PCAS, it is owned by somebody else,” he said. Mr Maguire said it was important to recognise the excellent work that Cattle Council of Australia and PCAS had done in initiating the Australian beef industry’s movement towards verifiable grassfed, natural beef programs, backed by standards. “It’s a credit to CCA that it has been able to take the project this far. What Teys is now working towards is taking program to the next step, beyond that,” he said. Beef Central asked Teys whether the establishment of an alternate company-controlled pathway to a pasturefed standard compromised the integrity of the program in any way. Producers who are not currently accredited under PCAS will carry-out an initial self-assessment to demonstrate knowledge and understanding of the Grasslands Standards and Rules. This self-assessment report will then submitted to Teys for desktop review, and if no major or critical non-conformances are found, the producer will be provided with Grasslands Accreditation. Twice per year, the Grasslands program will undergo a third-party systems audit in which a small random sample of accredited producers will be nominated for an on-farm audit with a Teys Australia authorised representative, carried out by a third party. The new program launched today moves from PCAS’s self-funded audit model, where each producer has to bear the cost of an annual independent audit, typically costing around $700. Teys says the alternate model outlined above will continue to be compliant with USDA raising claims for pasturefed natural programs, providing all-important access to the rapidly-expanding US pasturefed market. For those producers currently part of PCAS, there is no real change, as they will automatically be accredited to Grasslands on receipt of their PCAS certificate number. But as each producer’s annual renewal of PCAS falls due, they can either renew their membership of PCAS, or join Teys’ new Grasslands pathway. 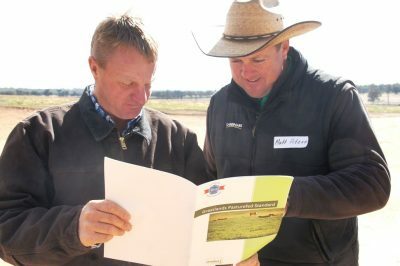 Holbrook beef producer Matt Pitzen, right, with Teys Wagga livestock manager Ben O’Kane, taking their first look at a copy of Teys new Grasslands Pasturefed standard. Producers who wish to, can remain fully within the PCAS program, allowing them to supply to all processors and supply chains accepting PCAS cattle – but they will have to continue to pay for their own annual audit. Despite the significant price premiums involved, the PCAS program has encountered some resistance from producers, over a range of issues including annual audit costs and other barriers to entry. Some producers have also demonstrated a reticence to expose their business to a third-party annual audit, under the PCAS model. These issues have hampered the ability of the PCAS model to continue to grow, particularly in southern parts of Australia, where smaller lot sizes and mixed farming enterprises are more common. A summary of Teys new Grasslands Pasturefed Standard pathway will be outlined to producers attending a producer field day at the company’s Jindalee feedlot today, and letters will be sent to livestock suppliers throughout Australia tomorrow, explaining the changes. Label approval for the new program is expected in the US within six weeks, but Teys will start accrediting producers under the new system virtually immediately, Beef Central was told. From late May, Teys direct consignment grids will no longer reference PCAS or ‘free-range’ premiums, but Grasslands premiums will replace both, reducing complexity. PCAS premiums currently offered by Teys are worth 10-20c/kg over MSA/EU-eligible cattle in northern and southern Australia. “The standards that underpin the Grasslands Beef Range have been developed to ensure these claims are verified. The standards are fully compliant with the industry definitions for the raising claims of ‘Grassfed’, Free-Range’, ‘HGP-Free’ and ‘Antibiotic-Free’,” the company said. Teys has performed a gap analysis against other industry and commercial programs to allow for recognition of PCAS (Certified Pasturefed + HGP-Free + Antibiotic-Free) Certified cattle, the company said. The Grasslands Pasturefed Standards and business rules have been developed to ensure a robust system is in place to guarantee the raising claims of ‘grassfed’, ‘free-range’, ‘antibiotic-free’ and ‘HGP-free’ are met. The system will be underpinned by an audit system involving annual self-assessments and second-party on site audits. Traceability & quality systems: demonstrating that the cattle are individually identified from weaning and can be traced throughout their life time. This can be done using NLIS or other eligible systems such as uniquely numbered and coloured management tags. Cattle must be Livestock Production Assurance and Meat Standards Australia compliant. Grassfed: Cattle must be lifetime-free from cereal grain feeding, including cereal grain by-products. Producers can still supplementary feed and graze a wide variety of forages includes grass (annual and perennial), forbs (eg. legumes, brassica), and graze cereal crops in the pre-grain state. Hay, haylage and silage can all be fed. Cattle need to have free access to graze in open pastures, however they can still be confined for necessary animal management or husbandry activities (weighing, drafting or weaning) for up to 20 days per animal each year. Animal production: Cattle cannot be treated with HGPs, however HGP-treated animals can still be run on the property, provided they are kept separate from Grasslands accredited cattle and clearly identifiable. Eligible cattle must be lifetime-free from antibiotic treatment through feed, water or injection. Stock can still treat cattle with topical antibiotics (applied to the skin) for conditions such as pink eye and anthelmintics (for treatment of parasites) and vaccines are also allowed in any form. If an animal does require further treatment with antibiotics due to sickness or injury, they can still be run in the same mob as non-treated animals, as long the treated animal is identified with a management tag so they can be identified as ineligible for Grasslands. Great stuff, I can now comfortable eat beef again in this wide brown land. We have been buying your beef from Woolworths and the texture and flavour is superb. Well Done. It’s Grasslands for us. Looks a lot more like the JBS Great Southern farm-assured model, to me. Will be interesting to see how southern producers respond, now that the annual audit process and cost is removed. Should be strong uptake, provided the premiums remain worthwhile.